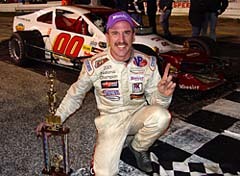 During the 2005 season, Ted Christopher ran 85 races in everything from a NASCAR Modified to a Super Late Model to a NASCAR Nextel Cup Series machine. Unless he gets into a snowmobile or sleigh with a number on the side of it, winter in New England should be the time for TC to take a well deserved rest. Right? This is something that Christopher has been trying to do for several years. Christopher didn’t bring a boatload of cash to the Brumos team. In fact, he didn’t write a check at all. He was chosen for his ability as shown in a test session with the team. Wrong. December is the perfect time for him to work on lining up his deals for the 2006 season. Christopher already has set plans for a limited schedule in the NASCAR Busch North Series next year and he has a Super Late Model ride lined up for Florida Speedweeks. He is currently working to make sure that his Jim Gallante-owned #13 NASCAR Whelen Modified Tour team will be back next year and has a few other things in the works as well. But the biggest feather in his hat could be the fact that he will race in the prestigious Rolex 24 Hours of Daytona in late January. Christopher will join the Brumos Racing Porsche team in America’s most prestigious road racing event on January 28th-29th. “I got a shot to practice and not to brag, but I practiced really well with the car,” said Christopher. “After the first day, they asked me to drive it in the 24 Hours of Daytona. On the second day, I went almost a second and a half faster than the first day. I was really getting acclimated on how to drive those things. Another thing that Christopher tries to do in anything that he drives is to get the most out of it. That's what he did with the prototype car, although it took a little bit of getting used to. And bigger things could be in the works for their second year together. And then there is Speedweeks in February. Christopher will be there as well as the Super Late Models and Modifieds take to New Smyrna Speedway for ten days of nightly racing. Between putting the Daytona deal together, Christopher has been busy trying to plan for 2006 with the #13 Mystique Motorsports team. 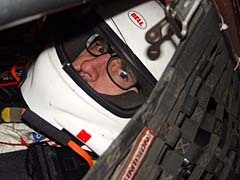 The Jim Gallante-owned operation nearly won the NASCAR Whelen Modified Tour championship in 2005, but its status for next year is a question mark. It could come back nearly intact or it could be dissolved. The #13 team, minus longtime crew chief Barry Kuhnel, is hard at work though. “The guys are still working there," said Christopher. On a different note, Christopher’s partial schedule deal in a NASCAR Busch North Series machine for the #35 team of NDS Motorsports is all ready to go. TC joined that operation after Brad Leighton left before the 2005 season. The success was instant. 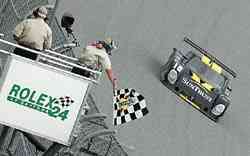 Christopher won at New Hampshire and finished five of his six starts for the team in the top 10. “People always tell me that I drive in too deep with all of the stuff that I drive,” said Christopher. “I couldn’t drive that thing in deep and that was the fun part. I was actually telling myself to drive it in deeper. But Modifieds, Super Late Models, Busch North cars and prototypes aren’t all that Christopher wants to race in 2006. He is also working on some other deals. 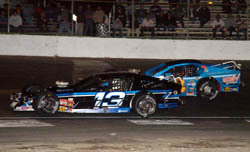 So even though he’s not racing in the dead of winter, December is far from a quiet month for Ted Christopher.